The High Velocity Oxygen Fuel (HVOF) process is developed to produce high quality metal, carbide and various specialty coatings. A complete line of powders is available, which is specifically engineered for application with the HVOF system. The commercialization of this coating technology now affords many industries the ability to use unique coating properties and extend the range of applications which previously could only be performed by proprietary coating processes. HVOF is a method of propelling molten particles on to work surfaces for each coating. As an essential feature of thermal spray coatings, sprayed particles – upon and after impact – deform so as to interlock with the impact surface’s profile. While the initial thermal spray technology focused on guaranteed deformation through excessive heating, a new method is introduced with the high velocity of HVOF. A small chamber is used to create supersonic velocity of exhaust. 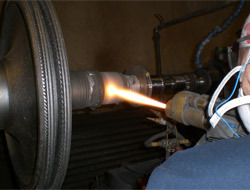 The focused exhaust stream receives the powder material at a velocity that the resultant impact forges adequate bonding. In fact, the impact from the kinetic energy is so great that most of the porosity is eliminated. As such, the less porous coating provides the best wear resistance and densest coatings available. At A&A Coatings, we perform HVOF coatings with the highest standards and deliver results that speak volumes about our 70 years of excellence in serving a wide variety of industries. Call us today to learn more about our HVOF coating services.